Scoters are usually seen at a distance and profile is an important method of identification. Note the long erect tail, thin neck and rounded head of this Male Common Scoter. The Male Common Scoter is an all black bird with a long pointed tail, often raised, and a wedge shaped black and yellow bill. It's plumage is similar in Winter and Summer although in the later it's dark black plumage is browner. Breeds mainly in Scandinavia and Iceland, around 70 pair breed in North West Scotland. Around 100,000 winter around the UK coastline, especially in the North sea. 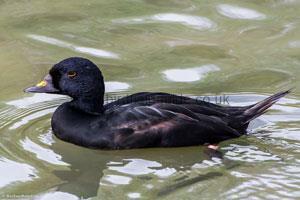 The Common Scoter can dive to depths of up to 35m in order to find it's shell fish prey. It's lifestyle and flocking habits make it particularly vulnerable to oil pollution. 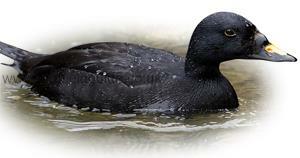 The Common Scoter is a marine bird only coming to shore in order to breed when it then moves to remote moorland pools. Most often it is seen in large flocks well offshore. Note the distinctive light face and neck of these Female Common Scoter catching the light. The Female does not tend to hold her tail erect as much as the Male does, hence why the tails are not so noticeable in this image. The Common Scoter jumps before diving and keeps it's wings held tight against it's body. The Velvet Scoter dives without the jump and tends to appear to slip under the water with it's wings partially opened. The Surf Scoter dives with a small jump with wings flicking open before disappearing below the surface. Common Scoter tend to fly in straight lines parallel to the shore, often in large numbers. 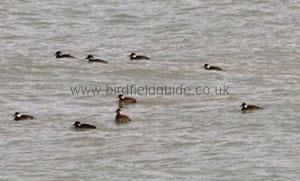 Common Scoter are typically seen 'rafted' in large flocks well offshore.